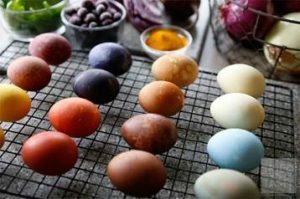 Easter is coming up next week so why not try out this natural egg dye. Those store bought kits use artificial food coloring which is not good for you, so here is an alternative to avoid the chemicals. The natural dyes will make their own pattern on the eggs but you can always wrap twine around the egg or even wrapping the egg in a leaf and securing with a cheese cloth. Be creative and make some unique creations. Happy egg dying ! Put 1 colors ingredients into a small pot with 2 cups of water and bring to a boil. Reduce the heat and let it simmer, covered, for 10 minutes. Add the vinegar and let the solution cool until it is warm or room temperature. Once cooled, submerge the egg into the dye and turn to evenly coat.